That looks like a removable or remote storage device. Is this a case where the app is displaying the items before the device is 100% ready? I doubt it. Here is my setup: iMac 24 inch with 8Gb RAM. LR is installed on my Hard Disk. The catalog is on the same drive. The pictures are on an external firewire 800 drive. Maybe I should report this to Adobe support? are they usually helpful for these types of issues? We're monitoring issues here. It would be helpful to track down steps to reproduce reliably so we can investigate. Well, it ended up being quite easy for me to find the way to reproduce the problem on my iMac and on an my MacBook Air. So 2 different computers running the latest MacOS X system and the latest Lightroom program. If the last time LR was quit, the Hard Disk publication folder was closed (i.e. : the triangle identified by the arrow in red in the attached image was pointing to the left), then the problem will happen the next time I open LR. 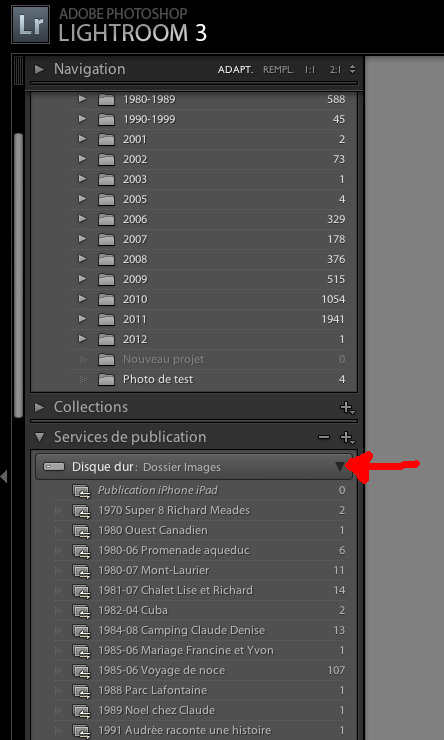 If the last time LR was quit, the Hard Disk publication folder was opened (i.e. : the triangle identified by the arrow in red in the attached image was pointing downward), then the problem will not happen the next time I open LR. Hope this is clear. I'm surprised this has not been identified before by more people. One other question, is the drive you are publishing to a slower memory stick type device or a faster USB hard drive type device? I am publishing to my iMac internal HD. Not able to reproduce on your side? You are of course welcome to do so, but I have been able to reproduce it on demand now, and a bug report is in. Great! Thanks. Were you able to reproduce this by simply doing like I described above, or where there any other things that you had to do to see the problem? I'm wondering if a workaround exist (any particular LR configuration that would make the problem go away) other than restarting the app. I can't reproduce the lack of folder names when creating the service again now (that worked first time), but you were absolutely right about the panel being closed when quitting being the issue. Nice catch. Is there a reference number for the bug report that I could also track? is this doable. Otherwise, I may report the problem as well. Yvon, this is as close as Adobe get to a public bugbase, so this IS the place for you to report it. As an Adobe Community Professional, I have access to some other bits behind the scenes, so yes there is a bug number, but it wouldn't help you. I've made a note against the bug to report back to you here when it's fixed. OK I see. I now understand how this works. Thanks for your patience!